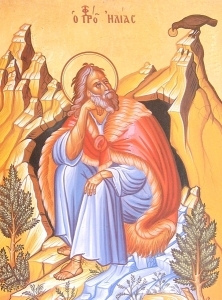 As the 'spiritual father' of the Order, Carmelites invoke the prophet St. Elijah in prayer, asking - like his disciple Elisha - for a double portion of his spirit. The following prayer is inspired by the Elijah narratives in the Bible's Books of the Kings. and acted on your Word. Help us to drink from the well of his wisdom. luring our hearts away from all false gods. Open our eyes to the needs of those suffering. Open our mouths to speak comfort and justice. Open our hearts to your voice in the silence. Send angels to strengthen us. Send the rain of your grace to quench our thirst. and bring life to places of death and despair. Send us as prophets to herald your Gospel. Allow us to rise to you in paradise. May Elijah lead us to your son.